Made up of more than 90 percent water, this is a great choice for keeping your family hydrated on a hot summer day. Being naturally so sweet, this is the perfect sweet treat! 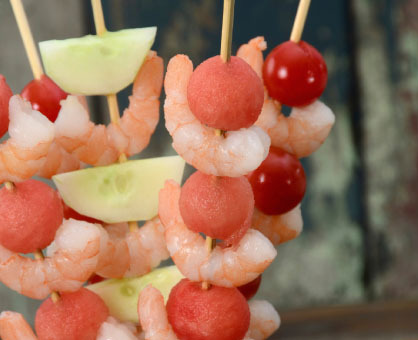 > Pair your shrimp kabobs with sliced watermelon and grill. > Grill watermelon slices then drizzle with honey and lime juice. > Bake a sweet potato on the grill for a nice smoky flavor. Top with cinnamon. > Cut a sweet potato into thin strips and bake for healthful sweet potato fries.